Hi there! I’m Dusty — the big, the bold, and the beautiful! 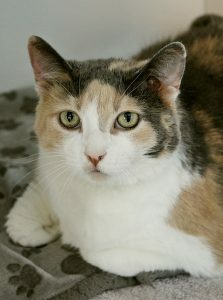 I’m a 7-year-old dilute calico lady and I am probably the friendliest cat you will ever meet. I fill everyone who meets me with love and laughter! 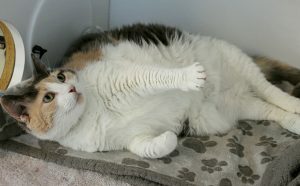 You may have noticed I’m a little over-weight, so I am currently on a diet, but am otherwise a perfectly healthy young lady who came to Pixie after my former owner became ill and unable to care for me any longer. I will instantly start purring whenever anyone starts petting me, and I’ll often roll over and let you rub my belly! I don’t have a mean bone in my body and everyone who meets me instantly smiles at how adorable I am. I have lived peacefully around a big dog before, and am mellow enough that I could probably adjust to living around other calm cats like myself. 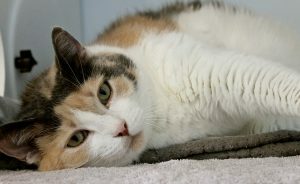 I’d do great in a family home with children but would also be a wonderful companion cat for a single person as well. All I really need is someone to help keep me motivated with my weight loss plan and to offer me love and affection — hopefully forever! Are you interested in meeting me? Come down to Pixie today! I come to you fixed, vaccinated, and micro-chipped for an adoption fee of $100.